This young deer fawn was illegally held inside a home in Wickenburg. The public is reminded to leave baby wildlife alone. PHOENIX — The Arizona Game and Fish Department took possession of a “kidnapped” deer fawn during a recent traffic stop in Wickenburg. AZGFD wildlife managers received a tip that a deer fawn was being kept inside a single-wide home and yard with three dogs. While being surveilled by the wildlife managers, the residents were seen placing the deer in their vehicle and leaving the home. Department officers stopped the vehicle, and one of the occupants was arrested on outstanding warrants. The fawn was confiscated and transferred to the department’s wildlife center in Phoenix, where it continues to be treated by a local veterinarian. The fawn will be placed at a licensed zoo in Arizona once deemed healthy enough to be transported. AZGFD reminds those who come across young or baby wildlife that most often the best decision is to leave them alone. Some species of baby animals, such as elk calves or deer fawns, may be euthanized because they cannot be released back into the wild due to disease concerns and the unfortunate fact that zoos and sanctuaries have limited space to hold them. 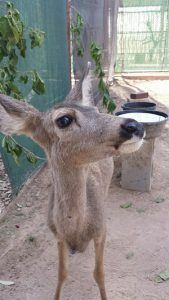 Fortunately, AZGFD was able secure a new home for this deer fawn, but that is not usually the case. The department’s Wildlife Center and others around the state are inundated every year with baby birds, rabbits and other wildlife that were unnecessarily taken from the wild. The public should contact a licensed wildlife rehabilitator if they encounter an animal that is clearly sick or injured with wounds or broken bones, unresponsive or lethargic, has been attacked by a cat or dog, or there is strong evidence that the mother is dead. Young wildlife found in your yard or in the field is rarely abandoned. Typically, once the perceived predator (you, or your cat or dog) leaves the area, one or both parents will return and continue to care for the young. Baby birds are the most common wildlife species encountered by the public and removed from the wild. Young birds that have fallen from the nest can be placed back in the nest, or as close as possible. If necessary, an artificial nest can be built and placed near the original location. Those baby birds that are partially flighted should just be left alone or in some cases moved nearby out of harm’s way. Contrary to popular belief, human scent will not prevent the parents from returning to care for their young. Eggs of ground-nesting birds like quail should be left in place when discovered. Those with questions about a specific situation should contact one of the wildlife rehabilitators listed on the department’s website at: www.azgfd.com/wildlife/urbanrehab/ or contact your local Game and Fish office.